Limited quantities available. Order now, and save! No expiration date but when they're sold out, they're sold out. Conversational Spanish Programs on CD and MP3 for Construction Workers, Social Workers, Law Enforcement, Teachers, Dietitians, Gardeners and Nurses. Too busy to attend language classes? Now you can learn to speak conversational Spanish at home, in your car, anywhere. Use our Conversational Spanish on CDs or MP3 and workbooks to acquire new vocabulary and learn how to use it in conversation. You will develop a working command of the language in a short amount of time. Eleven fun lessons filled with all new vocabulary, phrases, and sentences that focus on social and personal interactions. You will learn how to greet people, get to know them better, and even ask for a date. Audio sample! Your browser does not support the audio element. Available instantly. No shipping and handling charges. More convenient than ever, 11 lessons to use when and where you wish. Available instantly. Save money; no shipping and handling charges! More convenient than ever, 20 lessons to use when and where you wish. Conversational Spanish - Volume 1 on MP3 Revised! Program includes 63 lessons on MP3, 4 vocabulary reference cards and a 50 page Audioscript. Related item: Flash Cards to use as a study aid. Conversational Spanish - Volume 2 on MP3 Revised! Includes 15 contact hours certificate upon completion of course with passing score. Spanish Vocabulary and Grammar for Construction Workers on MP3 NEW DOWNLOADABLE VERSION! Available instantly and no shipping or handling fees! More convenient than ever, 30 lessons to use when and where you wish. Compatible with PC/Mac, iPod/iPhone, MP3 players. Also included: An Audioscript and Workbook of 76 pages in PDF format. Available instantly! No shipping or handling fees! More convenient than ever, 60 audio lessons to use when and where you wish. Also included: A combined Audioscript and Workbook of 75 pages in PDF format. More convenient than ever, 32 audio lessons to use when and where you wish. Also included: An Audioscript, Workbook of 143 pages and Flashcards in PDF format . Begin to learn Spanish immediately with our downloadable programs. More convenient than ever, 10 lessons to use when and where you wish. Also included: PDF Guide to vocabulary lessons and a 15 pages Audioscript Booklet in PDF format. Also included: Audioscript and Workbook in PDF format. For elementary school teachers and staff who wish to improve classroom effectiveness with useful Spanish words and phrases. Ease comfort levels for Spanish speaking students and their parents when you learn to speak Spanish! See more. Available instantly and no shipping or handling fees. More convenient than ever, 28 audio lessons to use when and where you wish. Also included: An Audioscript and Workbook of 95 pages in PDF format. Learn the important phrases, words, questions, and statements for communicating with your Spanish speaking clients. See more. Also included: A 27 page Audioscript in PDF format. Are you puzzled about the verbs Ser and Estar? Perhaps you have studied them but are still unsure about which verb is appropriate in your Spanish sentences. This Spanish lesson reviews the various expressions of "to be" and provides practice in how to use both verbs correctly. Download now, start learning or improving your Spanish right now. No waiting, no shipping and handling charges. Downloadable Spanish Lesson on Direct and Indirect Object Pronouns NEW! 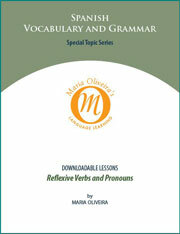 Downloadable Spanish Lesson on Reflexive Verbs and Pronouns NEW! Downloadable Spanish Lesson on The Prepositions Por and Para NEW! Downloadable Spanish Lesson on The Subjunctive Mood NEW! Downloadable Spanish Lesson on The Subjunctive in Dependent Clauses NEW! Learn to speak Conversational Spanish - affordable Language Lessons on CD or MP3!